Number 2 loves learning about space. He likes reading about space. He asks questions about the sun, the moon, and the planets. 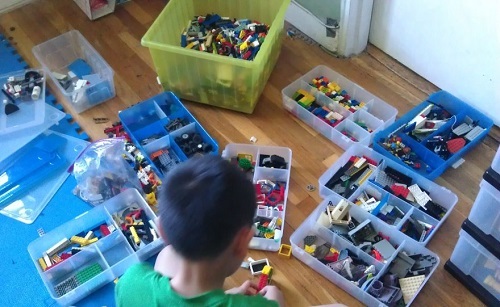 And of course, like any other kid, he started asking me to "buy it." Surely I can't buy the universe but I can buy a model of a solar system. But there are so many out there. Which one should I get? And after I got it for him, where would I put it? And more importantly, after we get one home, how long will it take before he stops looking at it and I get mad that I wasted my money? 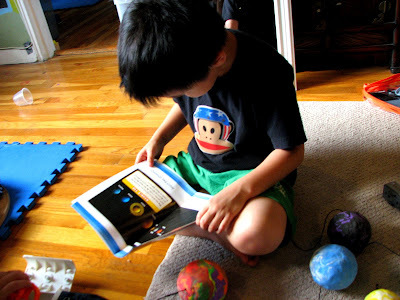 I hadn't answered all these questions before choosing to get the Creativity for Kids' Planets: Create a Solar System Mobile. Why? My kid is the boss and so I gave in. We've never had a solar system model at home. Maybe I made one when I was little for school Remember the shoebox mobiles? This solar system is recommended for ages 8 and up and while Number 2 is only five, I knew that I'd be helping so I didn't mind. I figured our resident 8 year old would be helping anyway. Additionally, I chose to have a mobile in order to save space even though I didn't know where I'd hang it. But the biggest draw? You have to make it. Making it is so much better than just buying it even though that means I have to get involved somehow... We are all so busy, I know!!!! But trust me, this one is worth your time! How beautiful is my kid's Jupiter? He was so proud of himself. The instructions are clear enough for an adult and probably for most 8+ kids. My child didn't really read the instructions because he's just five. 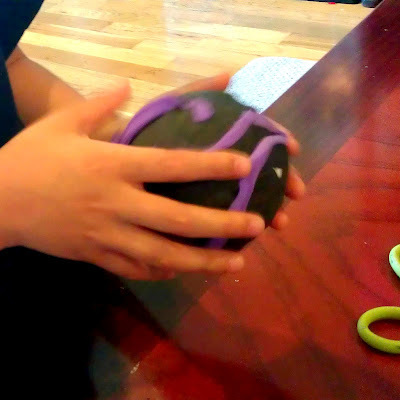 After scanning the instructions really quick, I handed a styrofoam ball to my son and we picked the clay color that he was supposed to rub onto the styrofoam ball. We had never done anything like this before. Have you? Have you ever rubbed clay onto something for the purpose of letting it stay there? And making those atmospheric swirls by rubbing different color clay onto the surface? That was exceptionally easy! The clay is very lightweight and soft. Honestly before opening the box, I was scared that even I would screw that up but rubbing the clay on was so easy and even a little addictive! It's like you want to make swirls everywhere! And we kind of did. This is how you begin the process of making swirls. After lining up a little string of clay in a different color, you basically just rub away. Making this was so fun and easy. Even letting the planets dry was simple. You just rub it on and set it down anywhere. It won't have a flat mark where it was set down. You don't even have to hang it to let it dry. This experience was not only easy, it was surprisingly relaxing and fluid and definitely mess-free. Solar system? Clay? Relaxing? Easy? Mess-free? Ask yourself, how many planet playsets are out there? The space shuttle is about to be burned by the sun! 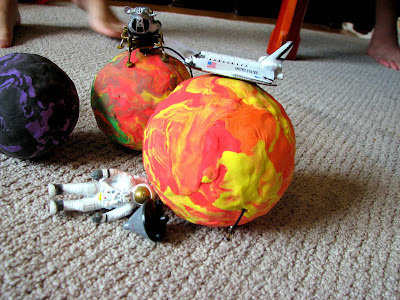 The clay dries fast and soon we had our planets all ready to be hung up. Then my children did something totally unexpected with the planets. They played with them! They pulled out some space toys that we borrowed from a friend and within an instant, aliens and astronauts were fighting an intergalactic battle. I thought we were just going to hang them up from the ceiling and look at them. Playing with planets is exciting and fun. You can put them back on the mobile when you're done. You won't ruin the planets- they are totally touchable! My kids showed me that these planets don't have to be hung! It is no different from a dollhouse in that way. 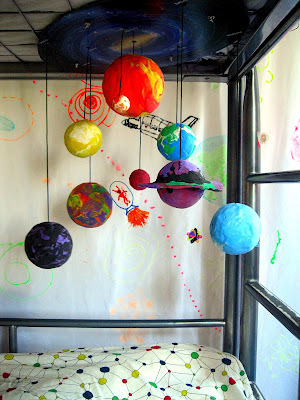 They are excellent props for science-themed pretend play! It's really amazing. Is this not the perfect place for a mobile? This mobile matched so well with the bed tent/curtains we made from Scribbles 3D Paint and Tulip Glow in the Dark Paint! If there was a contest to enter this photo I would do it!!!! Looks Delicate But It's Not! These planets are cleverly designed. They are lightweight but do not feel like they will fall apart. The strings they hang on are elastic so they will not snap. Basically, you can touch them and touch them all you like. To have fun and free play, you really don't want to think that your toy is delicate but these planets only look delicate. That makes it more fun. Who doesn't want to touch beautiful things? Moreover, since they are beautiful AND touchable, I think this set could really inspire more inquiries even AFTER the project is completed. While we were playing, Number 1 Son pulled out one of our space books just to prove to me that Uranus has rings too. Additionally, after a long session of play, Number 2 Son started reading about space on his own right there in the middle of the living room. It's not that my boys don't read but watching them pick up books in the middle of playtime was an immensely pleasant surprise! Seriously, this is not staged. They pulled out books in the middle of play. 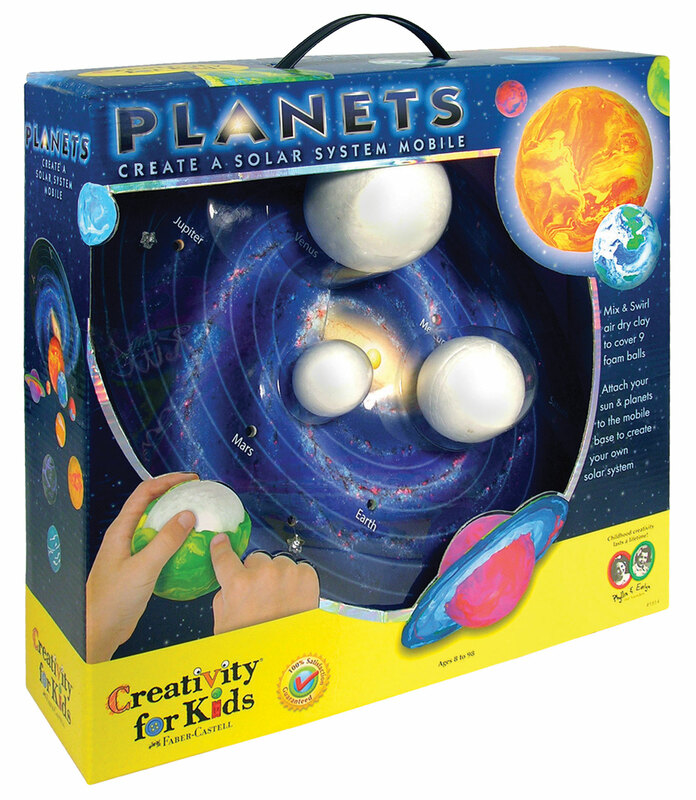 I highly recommend this solar system for play and exploration. Additionally, because of the touchable factor, this makes for an awesome science fair project - the judges can touch it too! (strategy: leave tactile memory) More importantly, it will be a project your kids can keep way after the fair is over. These planets are out of this world! 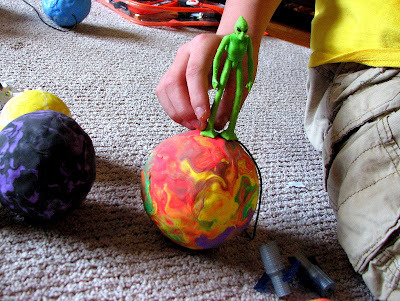 You will be totally tempted to make your own planets while you help them make theirs. Try not to do that in the beginning. 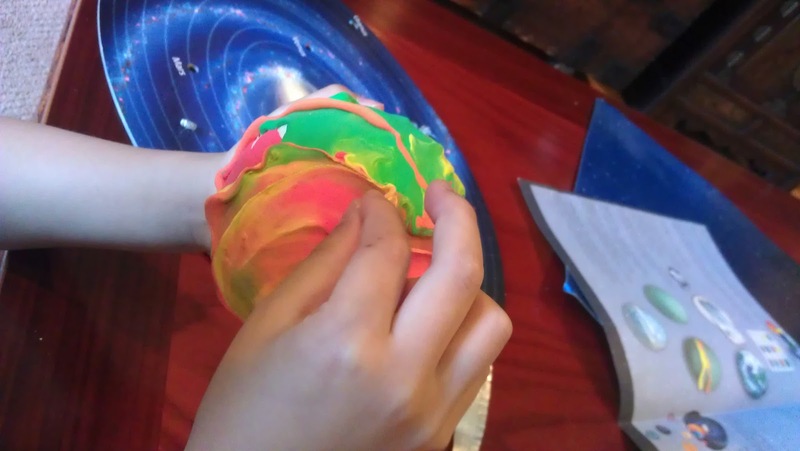 The bigger planets could tire out certain kids' small hands (lots of rubbing) so you want to have your hands free to help out but if you are in the middle of making your own planet, you'll have to work fast before the clay dries out. For a science fair project, see if you can devise a way to make Uranus spin on its side (like the way a ball rolls) and see if you can make a little ring for this planet (that part should be very easy). Can't wait for the giveaway- click on my Amazon link (see pic below) to buy your own today! That looks like so much fun! Fun to make (all those pretty colors!) and nice to decorate a kid's room. My 3 yrd old is already excited!! I am stunned that it is that easy... How could I have doubted you? My daughter has a budding interest in the solar system and this sounds like a perfect way to encourage more interest. That is the coolest thing ever! 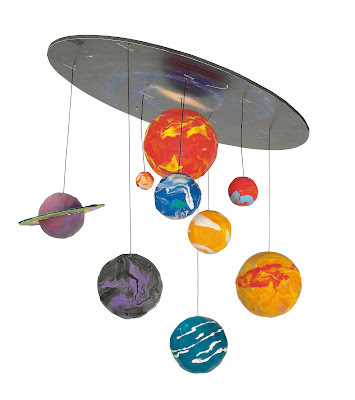 Liam's room has been planets and stars up till now... this would be a perfect addition (though for his 10th birthday he is getting a surprise Lego room remodel) I love that the kids get to build it themselves. i would have thought hanging it up was the only option, too. but kids are smarter than we are! 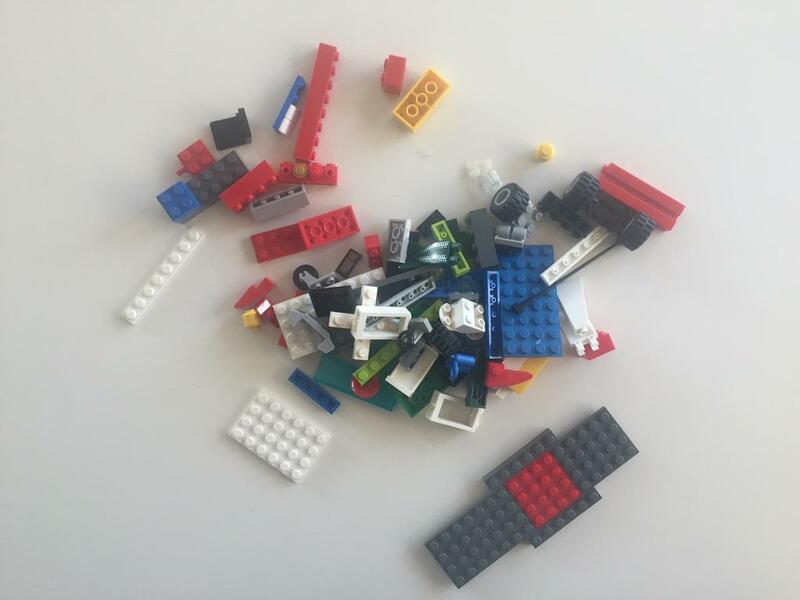 I think this is great, especially for kids that are more hands-on learners. Kids love solar systems, especially ones they can build themselves. Very unique! Love the ability to encourage a long term project. 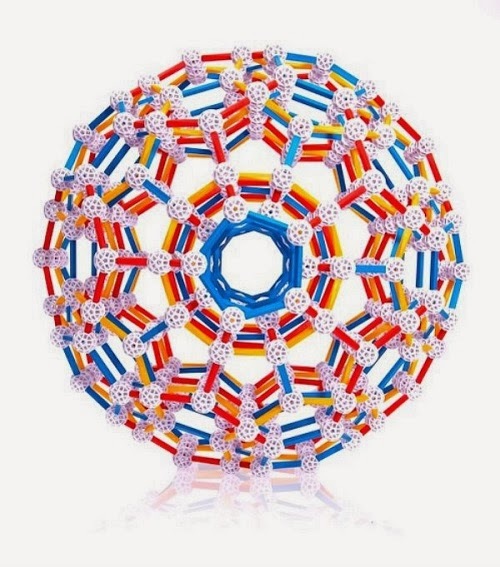 Would love this for my 6 yr old adhd gegeniou! Love this! I thought it was paint and passed it over at first. Took a second look and realized it s clay. How cool is that!!!!! I missed the giveaway as I was distracted with other things and not checking your awesome site enough, but glad I clicked around to read old posts. This looks awesome and I can so see my kdis playing with it -- not jist hanging it. So, good to see that it's durable.